Lock in a great price for La maison du monde – rated 9 by recent guests! Set in a 12467 ft² Mediterranean garden, La Maison des Rituels du Monde features a seasonal outdoor swimming pool. Free limited WiFi is provided in public areas. A terrace opening onto the garden are offered in the soundproofed studio and apartment, which are accessible by a stone, exterior staircase. Both accommodations are provided with tea and coffee making facilities and flat-screen TV. You can request a hot-stone massage, a Thai massage or a massage with essential oils for a surcharge. Private parking is free on site and you can visit Orange, 16 mi away, and Avignon is a 50-minute drive away. This property also has one of the top-rated locations in Saint-Gervais! Guests are happier about it compared to other properties in the area. This property is also rated for the best value in Saint-Gervais! Guests are getting more for their money when compared to other properties in this city. 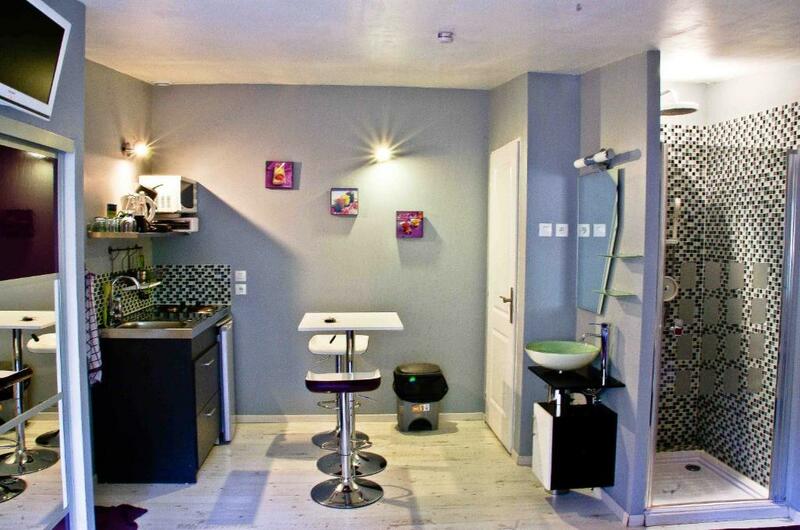 Accessible by stairs, this air-conditioned studio includes a kitchenette, a dining area and a flat-screen TV. This apartment has a large double bed or 2 single beds. It features adjustable air-conditioning, a flat-screen TV, a coffee machine and an iron. It is composed of a dining area, kitchenette, bedroom and a bathroom equipped with toiletries and a hairdryer. Luxuries include a private terrace, garden and Shared swimming pool. Wellness massages can be enjoyed on site from EUR 25. In a natural setting, in a quiet pine forest, a few minutes from the city, our independent rental units await you. A deposit of 30% by bank transfer or check is required to secure your reservation. The remaining balance must be paid in cash upon arrival. The property will contact you directly after booking to provide you with instructions for the bank transfer or (French) check. Cash, checks and bank transfers are accepted methods of payment. Bed linen and towels are not provided. They can be rented on site. Please contact the property for more information, contact details can be found on your booking confirmation.